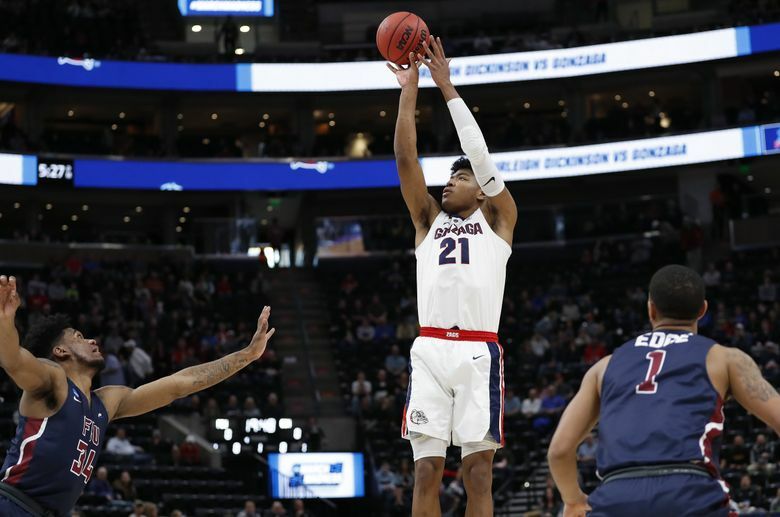 SALT LAKE CITY — Fairleigh Dickinson’s leading scorer Darnell Edge drove into the lane, elevated for his first shot and discovered he no longer had the basketball. The ball was stripped away and trickled out of bounds as the shot-clock buzzer sounded. A few minutes later, Knights senior forward Mike Holloway Jr., who averages 11.7 points in 127 career games, caught a pass on the low block and appeared to have an opening to the rim. He elected to dribble out to the middle of the lane and his shot was rejected by Killian Tillie. 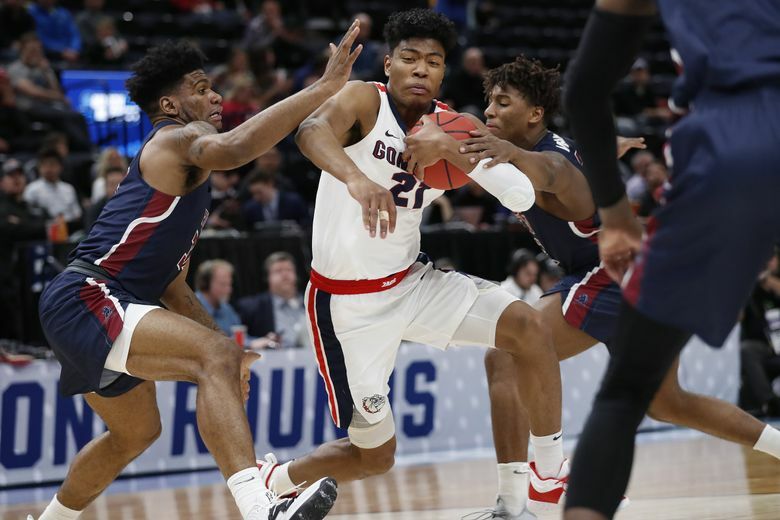 It was a different story at the other end as Gonzaga’s smothering defense led to a flood of transition points. 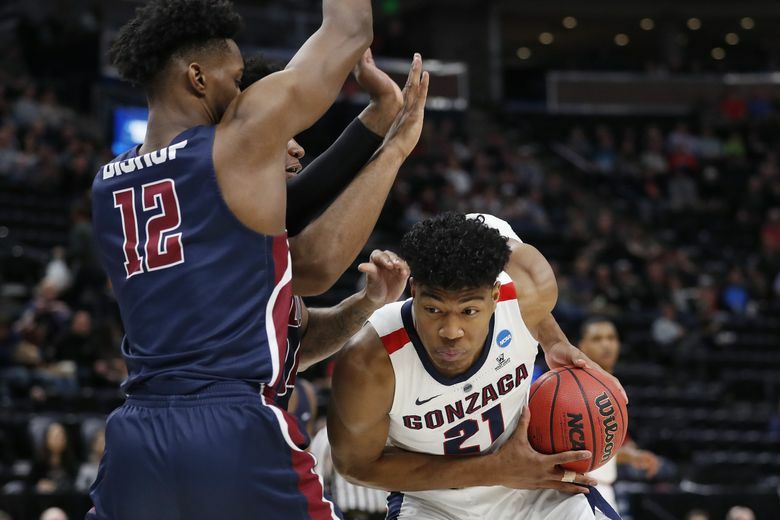 When the Zags did miss, they usually collected the rebound and capitalized. 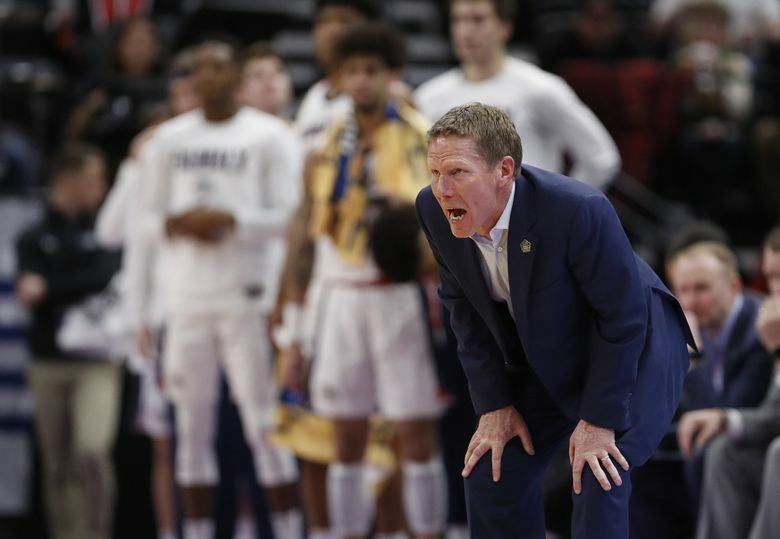 There was no Saint Mary’s hangover, no sweating out a 1-versus-16 seed opener the way the Zags experienced in 2013 against Southern. 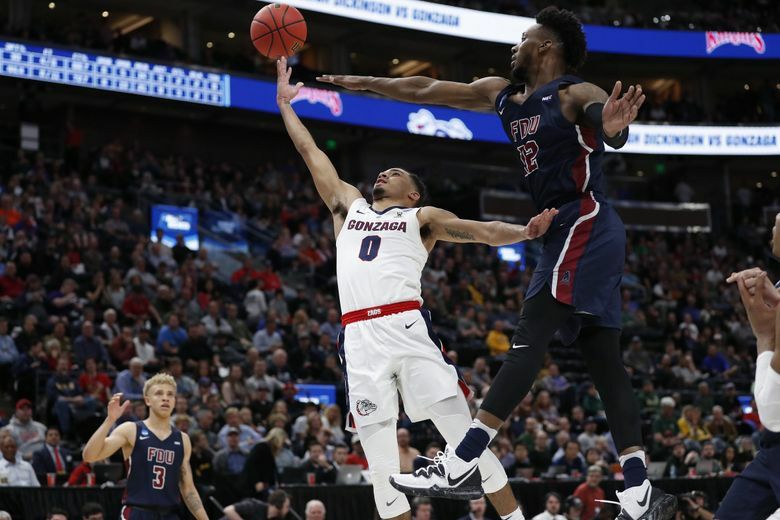 There was top-seeded Gonzaga’s 87-49 blowout Thursday that broke the school record for largest margin of victory in an NCAA Tournament game, surpassing a 27-point rout over Valparaiso in Seattle in 2004. 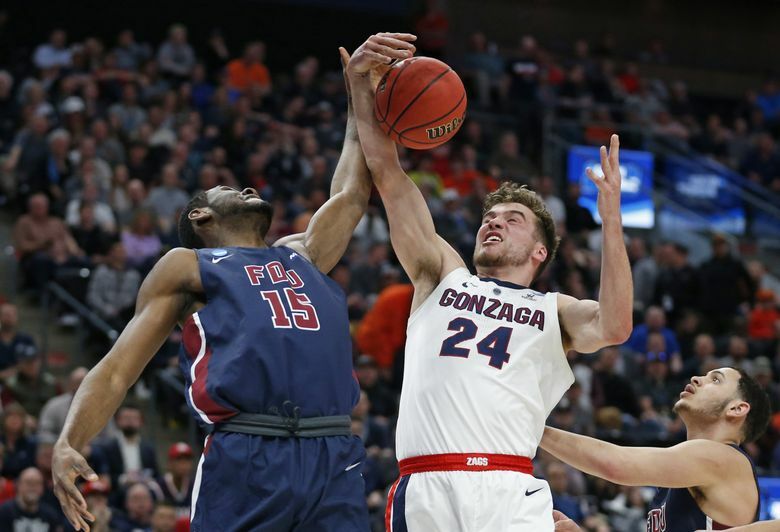 The Zags (31-3) kept stacking up points and not allowing them — that’s pretty much an unbeatable combination — and when Tillie buried a three-pointer the Zags jogged off the court with a 53-17 halftime lead. Tillie had another strong performance in his third game back from a partially torn plantar fascia. The 6-foot-10 forward had a season-high 17 points in 18 minutes. He connected on a pair of threes and a soaring dunk in traffic. He made 7 of 8 shots and added four assists. 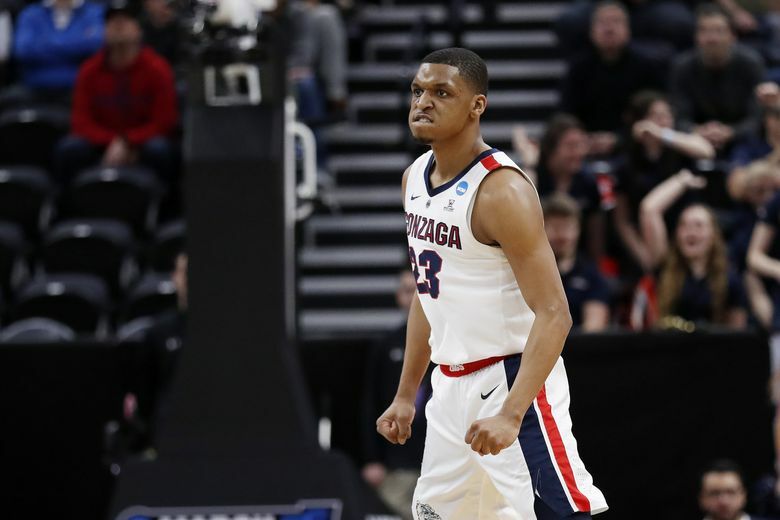 Sophomore wing Zach Norvell Jr. bounced back from one of the toughest outings of his career — two points against the Gaels — with three three-pointers, 13 points, seven assists and six rebounds. He buried his first shot, a pullup three-pointer in transition, and left off a little steam. 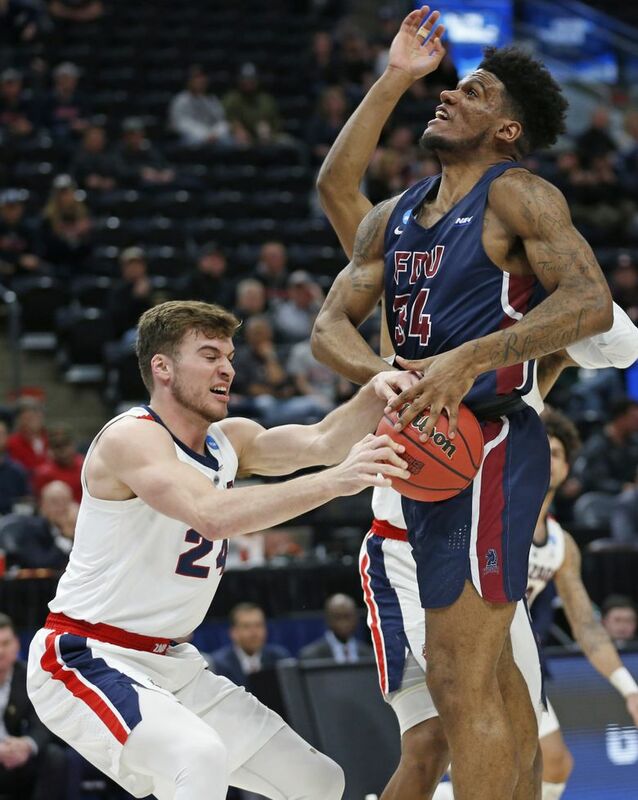 Fairleigh Dickinson (21-14) perked up offensively in the second half, but never seriously cut into Gonzaga’s lead, which reached 42 with 5 minutes remaining. Edge never got comfortable. 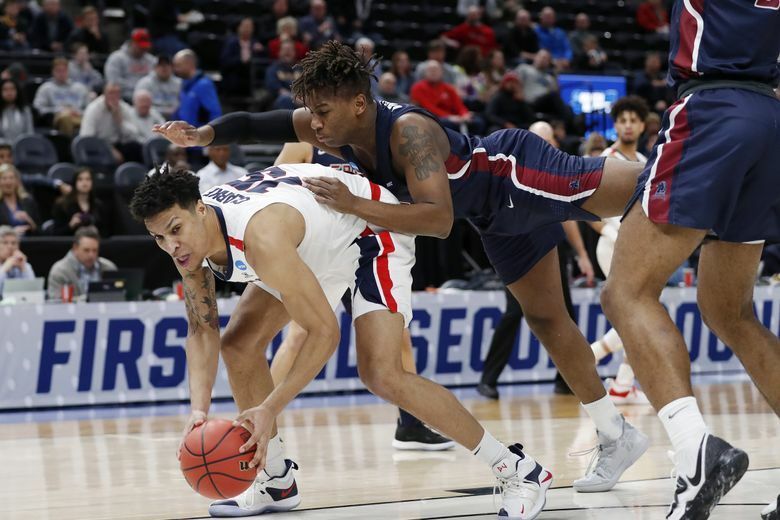 Running mate Jahlil Jenkins, who scored 22 points in the Knights’ play-in win, tweaked his right foot or ankle early on and finished with just seven points. “If we get our bigs jumping at the rim every time, it can make players second guess their shots in the paint,” said Clarke, who had three of the team’s six blocks. Gonzaga shut off the paint and covered the three-point line. FDU made only five field goals in the first half and shot 30 percent overall. The Knights, who came in fifth nationally at 40.4 percent on three-pointers, hit just six and connected on 28.6 percent from distance. 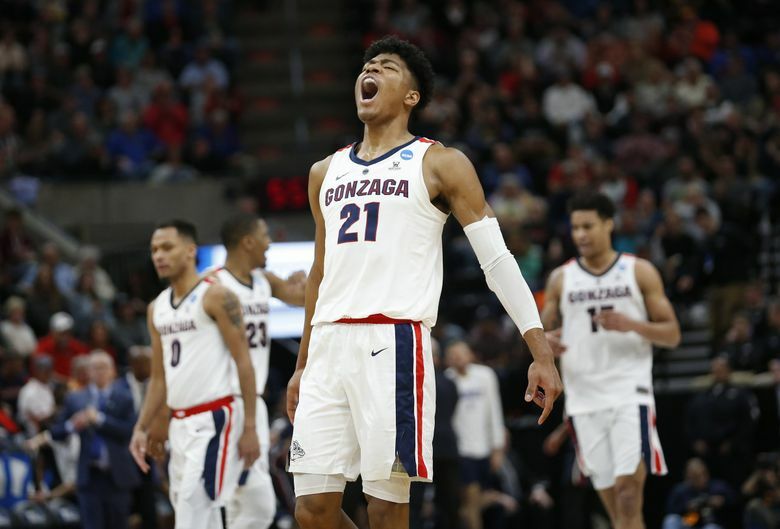 Gonzaga pocketed its 11th consecutive first-round NCAA tournament win, matching Kansas for the nation’s longest active streak. The Bulldogs will play ninth-seeded Baylor on Saturday in Salt Lake City with a spot in the Sweet 16 on the line.